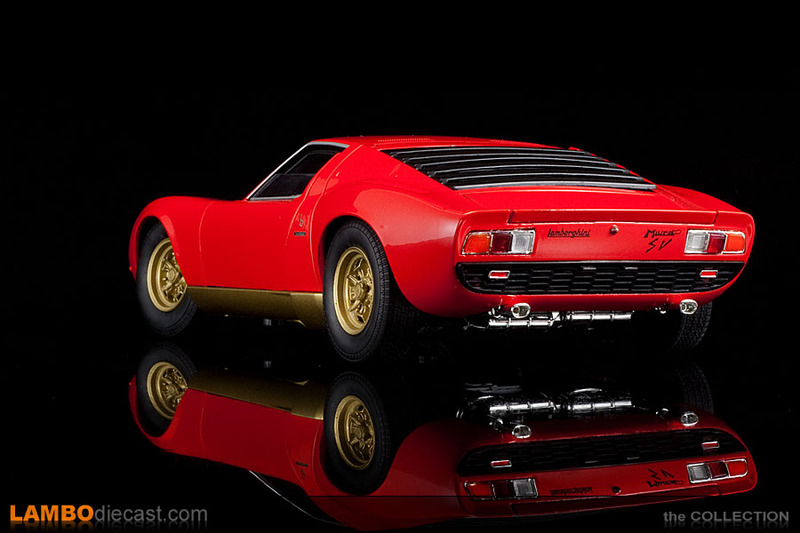 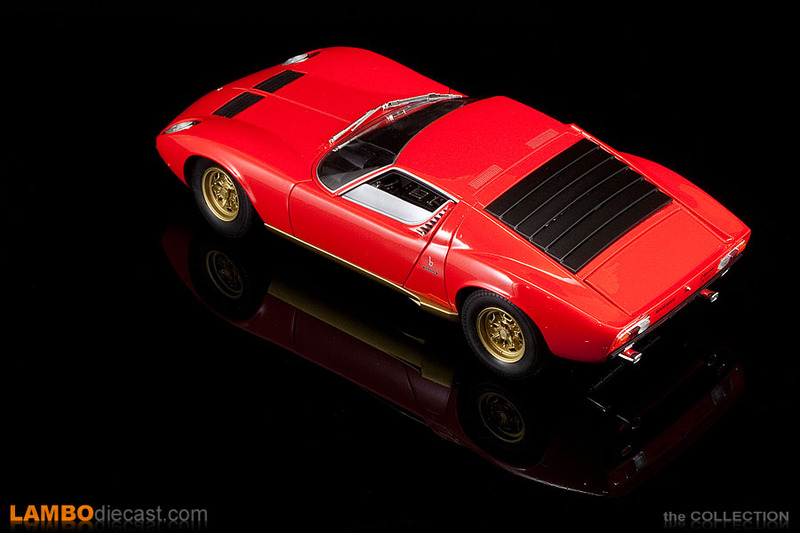 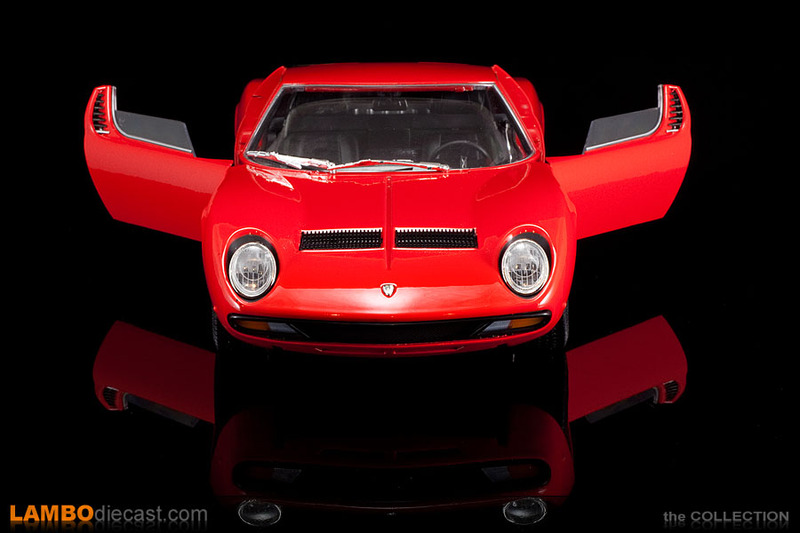 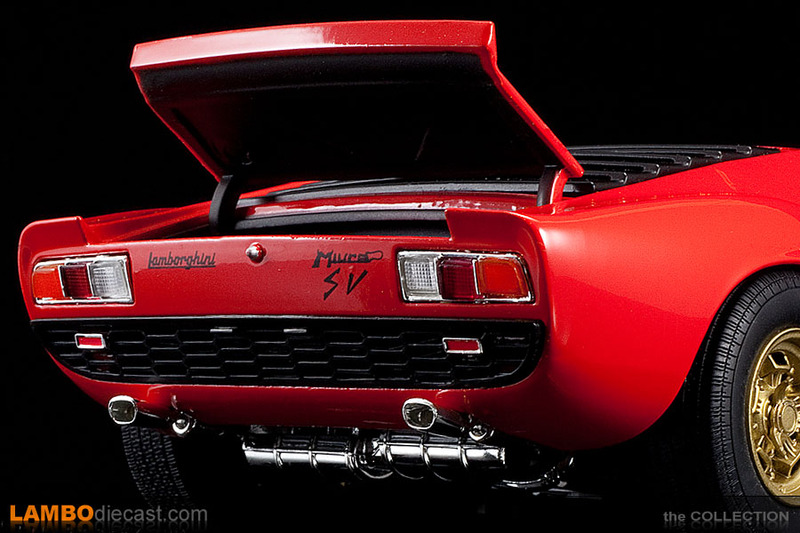 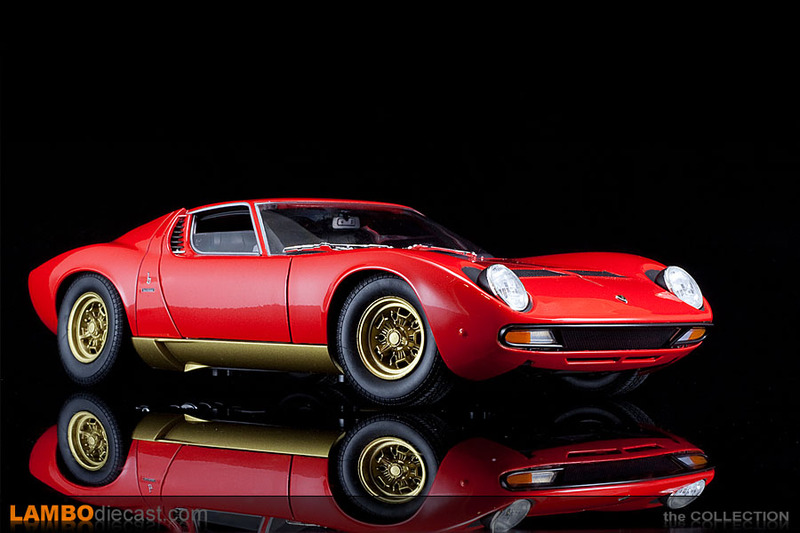 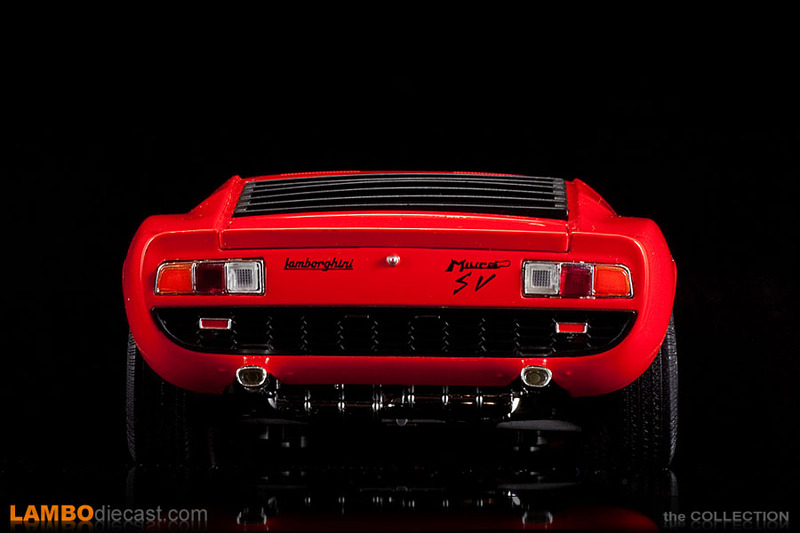 The Lamborghini Miura P400 SV is one of the most beautiful and sensual looking Raging Bull ever made, so when a nice 1/18 scale model comes around I'm automatically drawn to it, so when I noticed an auction for a Welly made diecast that was rather low on bids I delved in ... and made the winning bid on a yellow Miura SV by Welly with only €16 while these are normally priced around the €30 mark. 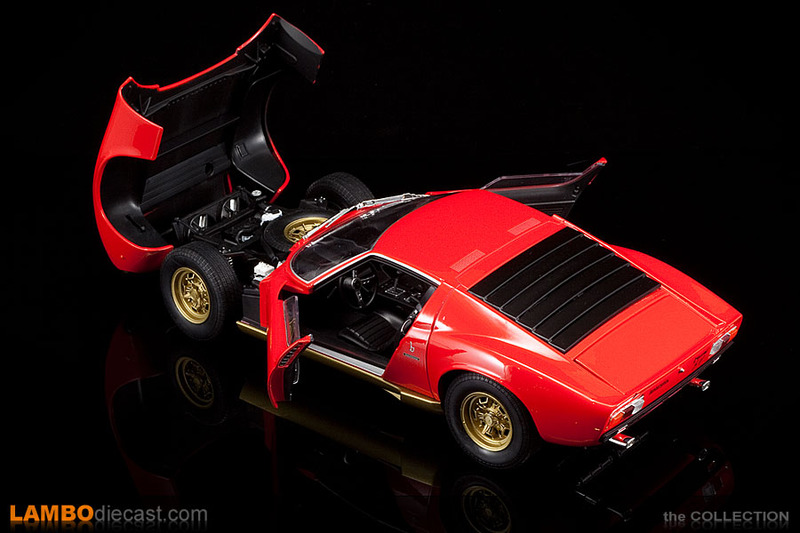 With a price tag like that I wasn't expecting too much ... but I was in for a serious surprise when it arrived ... these Welly made Miura SV are extremely nicely detailed for that kind of money, the only downside is the fact the engine cover doesn't open ... but other than that these are a real must have in any collection. 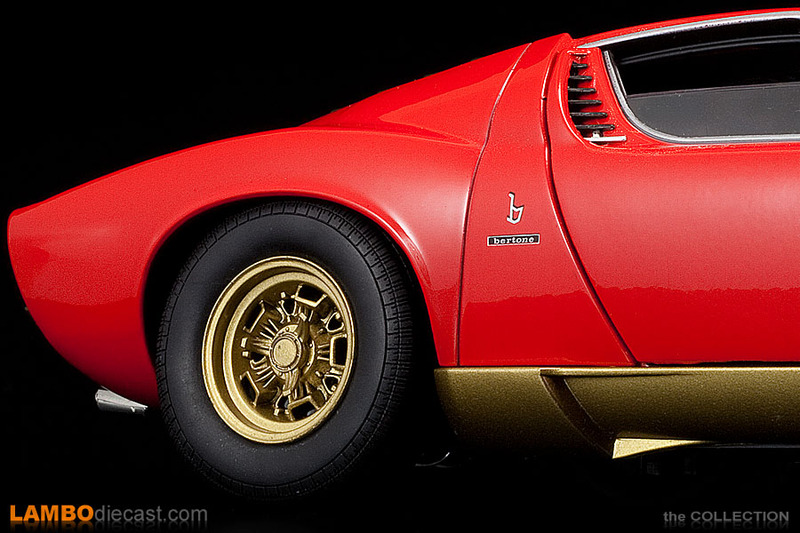 Sure there are some dust particles on the paint, and while the yellow one was nearly perfect this red one does have a few black 'overspray' dots ... but nothing some nail polish removal can't solve in a matter of minutes ... 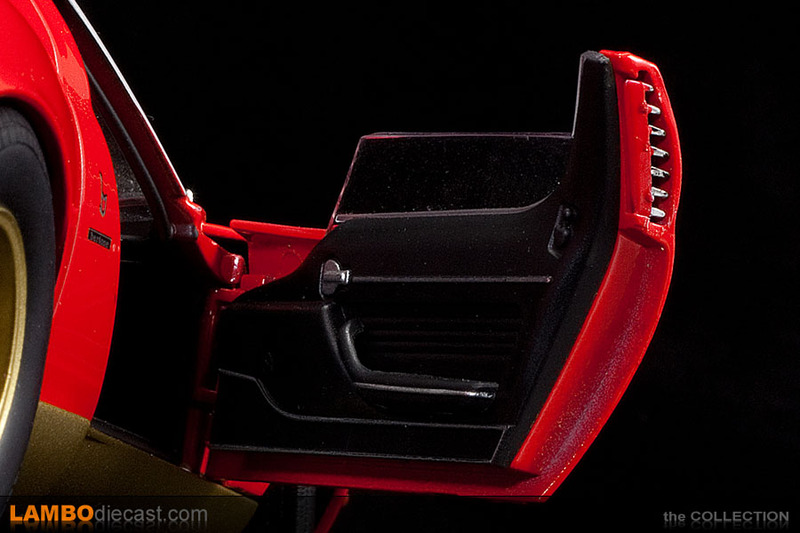 I did notice this red one is also missing a dial on the dashboard, but once again a little PhotoShop and a print out on self-adhesive paper solved this issue quickly. 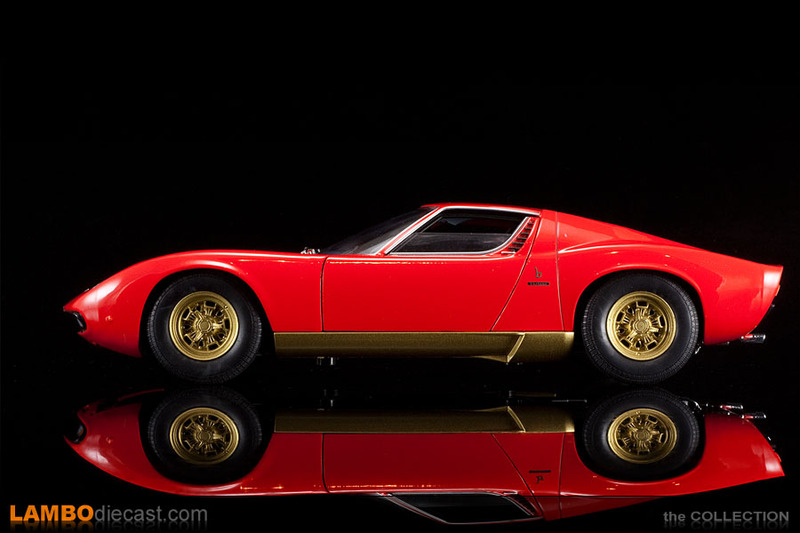 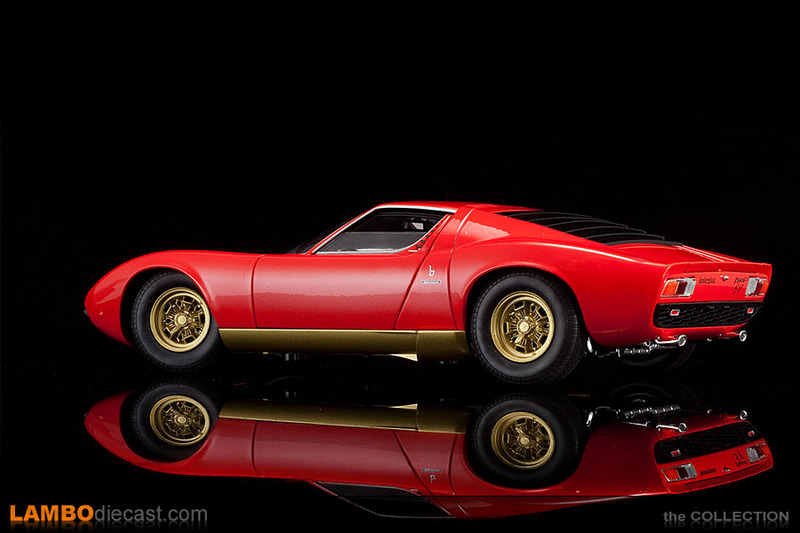 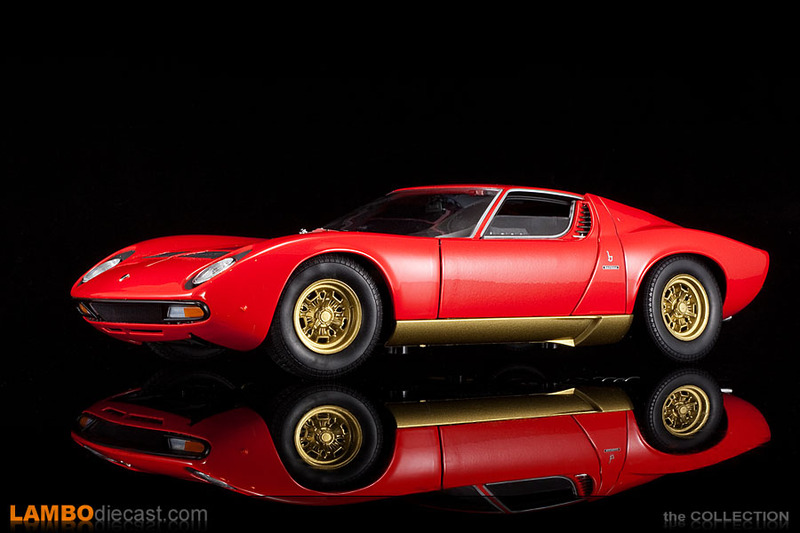 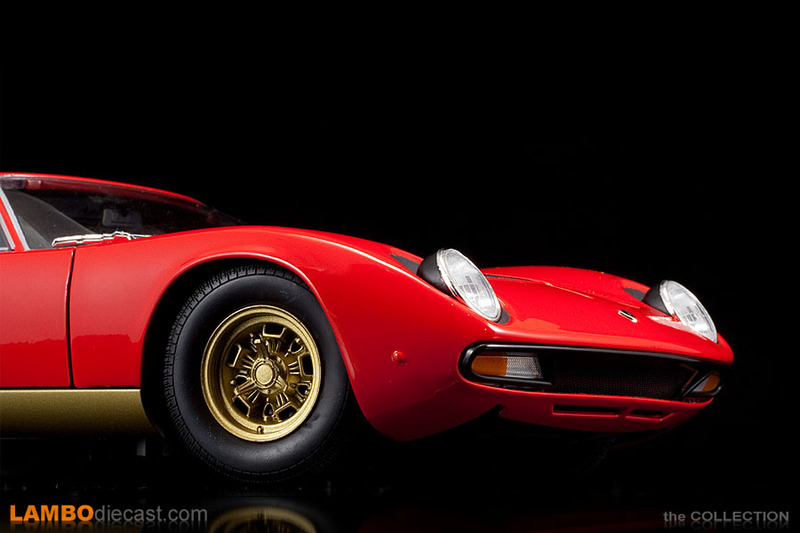 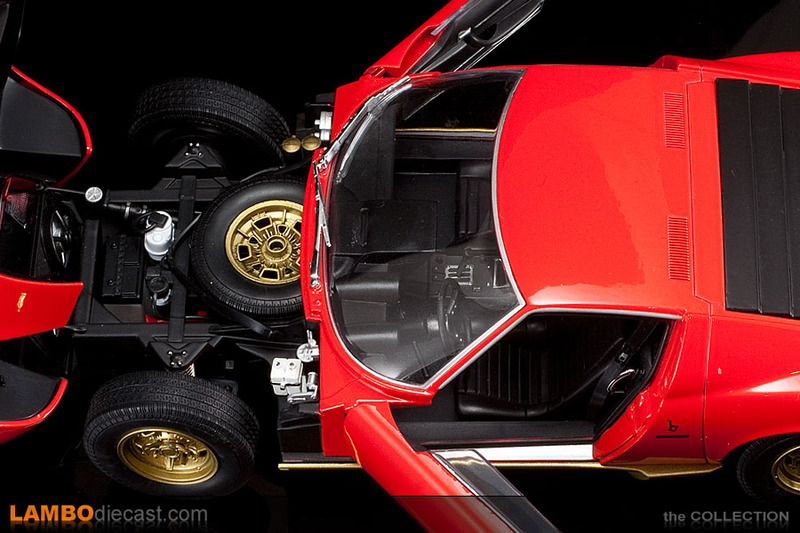 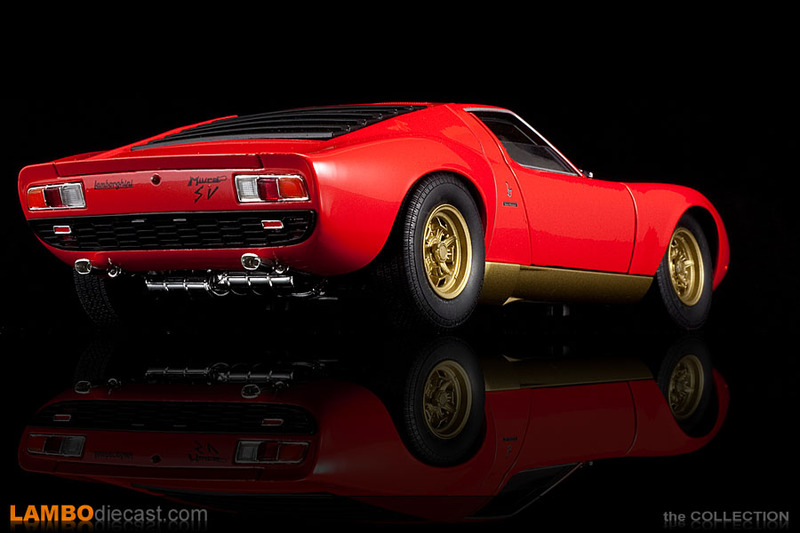 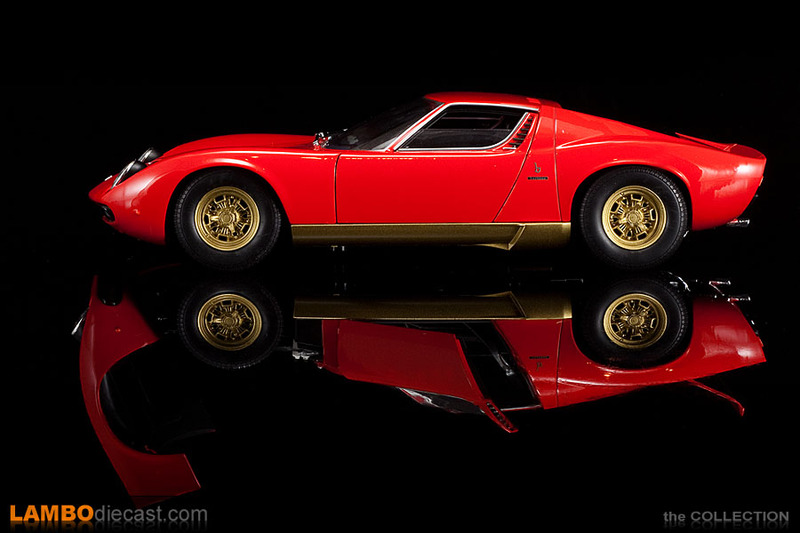 While the yellow Welly made Miura SV rolls on silver knock-off wheels and silver rocker panels, this red shade gets the Midas touch, here the wheels and lower side panels are finished in the classic gold paint seen on many Miura in this Rosso paint. 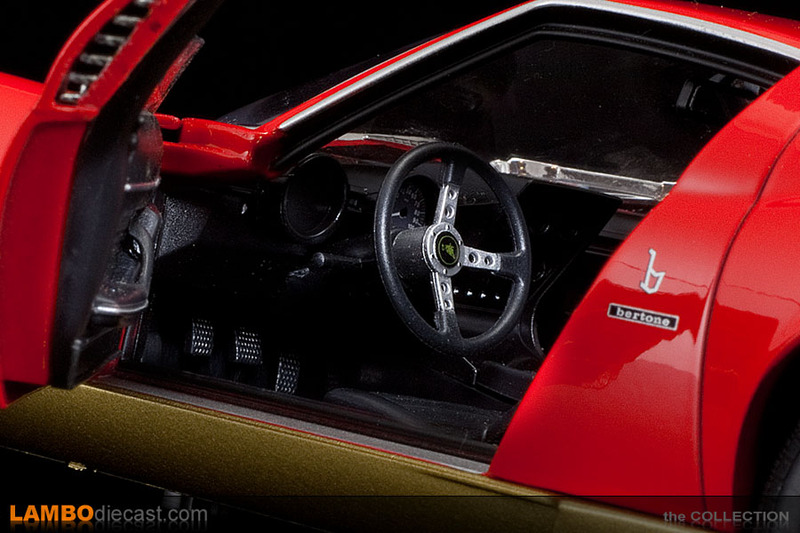 Inside a full black leather interior is replicated, the two massive dial pods look amazing and that sloping central console looks real enough to me, also note the gear lever and accompanying slots look very nicely scaled down ... it all just looks right. 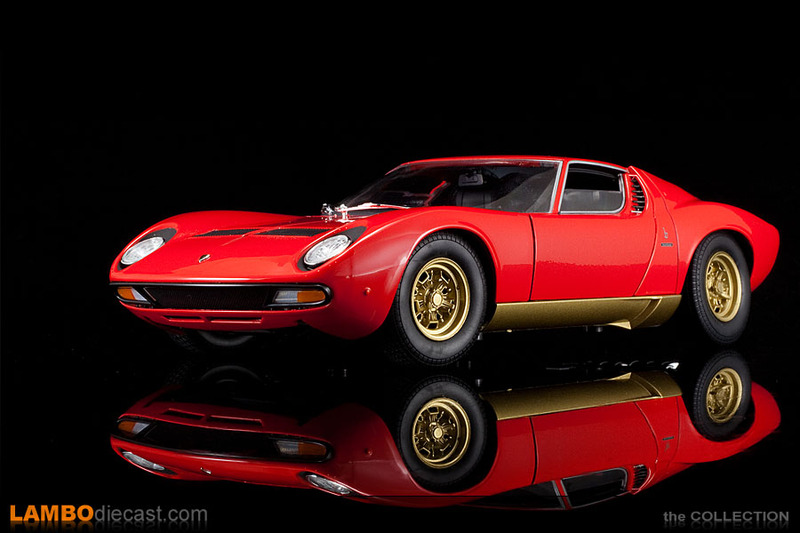 A bit strange is the absence of air conditioning on the dashboard, many Miura SV received this option, but Welly went for an early model without a cooled down cockpit ... on the other hand the detail underneath the front hood is really amazing and to make the deal even sweeter Welly has adjustable headlights, a small lever inside the wheel well allows to put the lamp pods up ... and down. 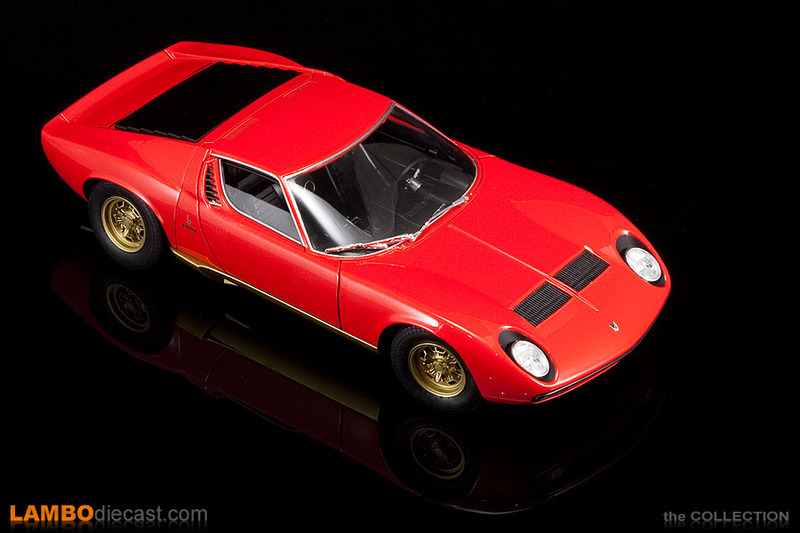 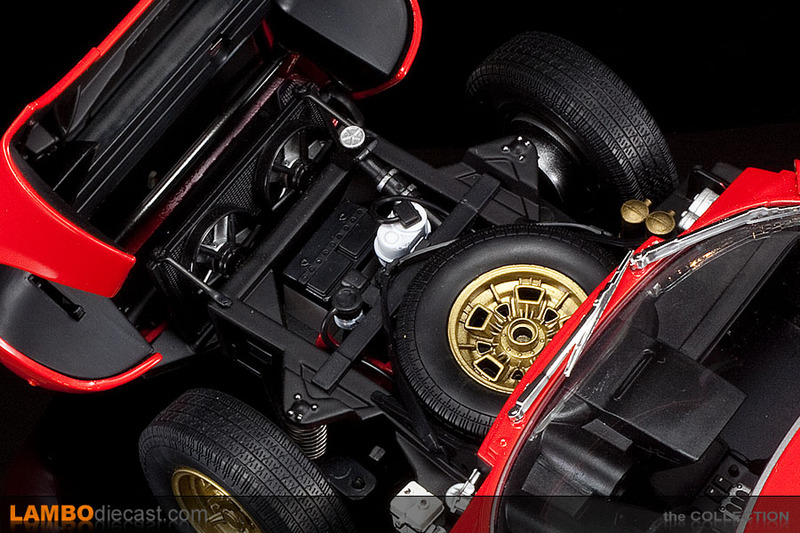 So if you want a nice looking Lamborghini Miura SV 1/18 diecast model and don't want to pay the prices for the Kyosho or AutoArt made model this Welly is a very good alternative.